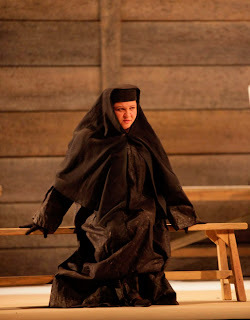 Russian soprano Maria Gavrilova makes two important debuts on May 4, 2013—her Seattle Opera debut, and her role debut as Suor Angelica. In fact, it’s the first time anyone sings Suor Angelica at Seattle Opera—like La Voix Humaine, Suor Angelica is new to our stage. This delightful young woman, who has sung many heroines of Italian and Russian opera at the Met and at the Bolshoi, told me a little about growing up in a theatrical family and about the overwhelmingly powerful music she sings in this opera. You’re new to Seattle Opera—welcome! Can you tell us a little about Chelyabinsk City, where you grew up in central Russia? Yes, it’s in the Ural Mountains, in central Russia. Lots and lots of factories, very industrial—so much so that the city has had lots of problems. Including this recent meteor, which devastated things in March. Do you get back there very often, to see family, for example? Yes...my husband’s family. There are not many left in my family. But my husband’s family is there, and every summer we go to Chelyabinsk and stay with them. Is there an opera company in Chelyabinsk? Yes, a very small but pretty opera house. Sometimes they’ve invited me to sing there, which is nice. So do you make your home in Moscow? Yes, I have an apartment in Moscow, and a little country house outside the city. Yes, I rent a little apartment there. Just near Lincoln Center, because while I have sung quite a few roles at the Met in scheduled performances, I very often cover roles, and if something happens to my colleague, I may have to be at the Met in ten minutes—always be prepared! How old were you when you first began singing? My parents were both singers, so I more or less grew up in the theater. 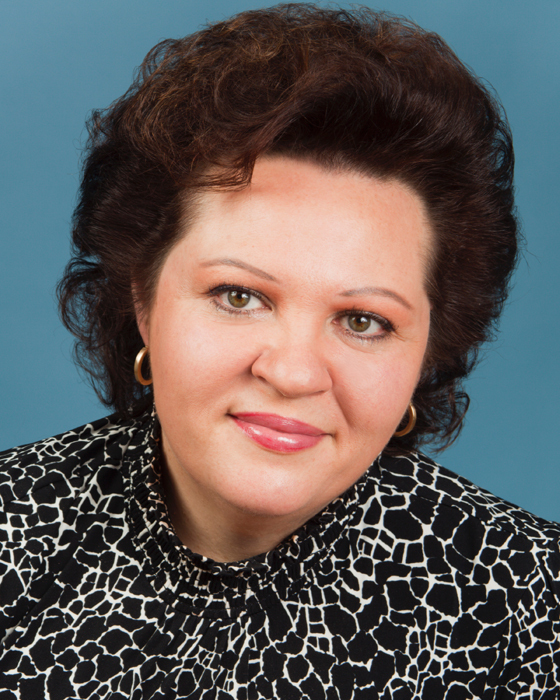 I sang, first in choruses, and studied voice and piano when I went to college in Chelyabinsk. I was 23 years old when I went to Moscow Conservatory. And after three years, the Bolshoi theater invited me to be a Young Artist there. You’ve sung a great deal at the Bolshoi, and at the Met. What’s your favorite theater? It is very nice for me to perform in Moscow, at home. I don’t particularly like to fly. And it’s a long way from Moscow to Seattle...we appreciate very much your making the trip! Now, you’ve sung many Puccini soprano roles: Mimì, Cio-Cio-San, Tosca, Manon Lescaut. What about La fanciulla del West? And Suor Angelica, now, for the first time. Which has been your favorite? I know people like to answer that question...but I really can’t answer it. Each role is me; this is my blood, these are my emotions, every inch. Is there one of them that’s easier to sing than the others? 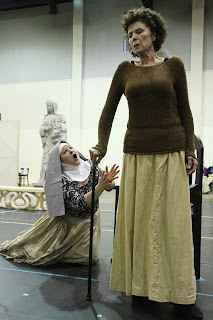 I can’t really call any of them easy; but Suor Angelica is shorter than the others. And there’s so much in it; it’s so powerful. If you even begin to think how sorry you are for this girl, you start to cry. And then, that’s it, you can’t sing. 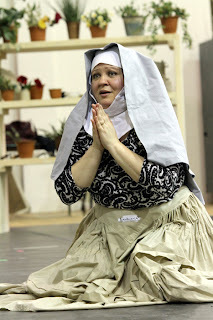 Well, I’ve sung Khovanschina, by Mussorgsky, I played this character of Susanna, who’s a religious fanatic. 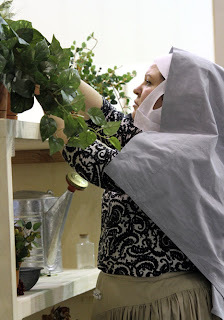 Not an orthodox nun, in terms of the actual Russian church. In fact, a very ugly, nasty, terrible person! In Suor Angelica, starting with the exit of your aunt, it’s just you alone onstage until the end of the opera. You sing your aria, “Senza mamma,” then build up to this wonderful, agonized, mystical death scene. How do you pace yourself through all of this? Ah, but this is Puccini’s genius. It’s paced brilliantly—a little bit forward here, more emotion, more passion, and then you pull back, and give a little less. Oh, of course... [sings]...you stay with this joy, and it’s so beautiful, beautiful, beautiful! And then she goes and poisons herself! Oh, but that is not what she thinks. She thinks she is finally going to be with her son. Ok, for her it’s a happy ending. And meanwhile, out there in the audience, we’re crying our eyes out! No, after all, that’s why we go to Puccini operas. We look forward very much to hearing you do it.